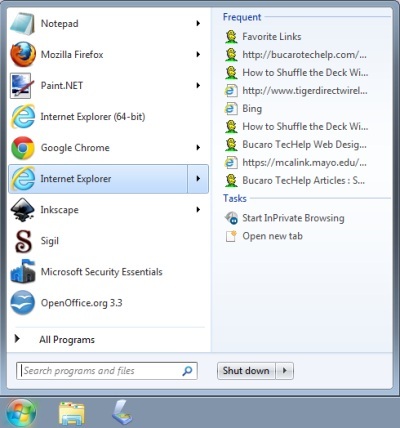 Windows 7 displays in the Start Menu lists of all recently opened files and applications. This allows you to quickly re-access those files and applications by simply clicking on their link. But if you're not the only person that uses the PC and don't care for others to know your PC use history, you may want to disable this feature. 1. Right-click on an open space in the taskbar and in the popup menu that appears, select "Properties". 2. In the Taskbar and Start Menu Properties dialog box that appears, click on Start Menu tab. 3. 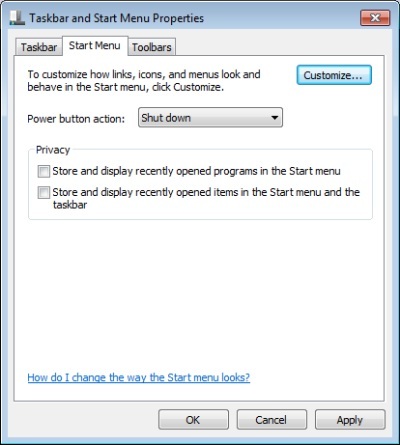 On the Start Menu tab, uncheck the checkboxes next to "Store and display recently opened programs in the Start menu" and "Store and display recently opened items in the Start menu and the taskbar". 4. Click the [Apply] and [OK] buttons to save the changes. Next time you open the Start menu, the lists of most recently opened programs and most recently opened files will not be displayed.